For our third Meal in 15 Minutes or Less lunch, we are going to make a ham and turkey wrap. 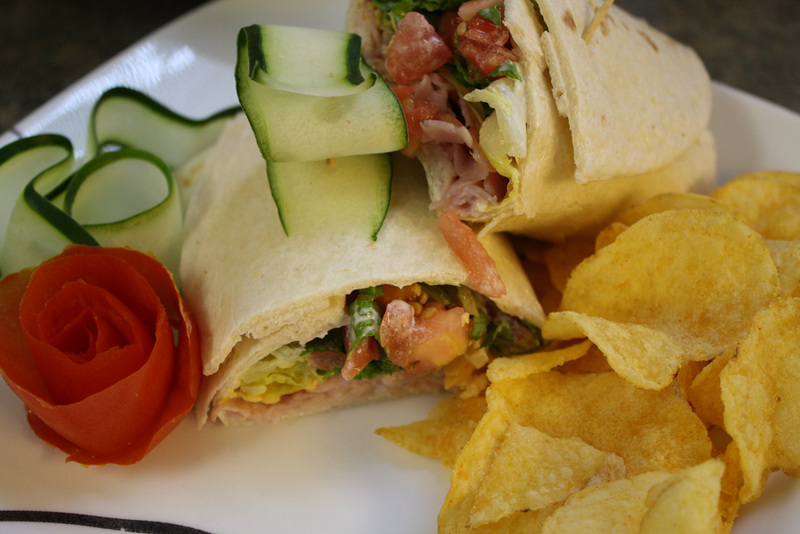 This beautiful wrapped sandwich is easy to make and, because the tortilla does not get soggy as quickly as regular bread, it can be made in advance! 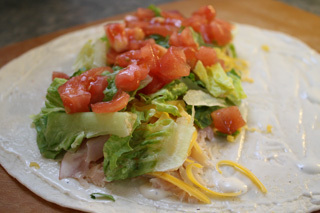 It is important to acknowledge that each person has their own take on how to make a wrap and which ingredients are best; with this recipe, I offer a starting point for a basic wrap. Feel freel to switch up the ingredients to suit your palate! Now let's get to the wrap making! Start by warming the tortilla in the microwave for about 10 seconds. This will help make the tortilla more pliable and less likely to tear when we wrap it up. 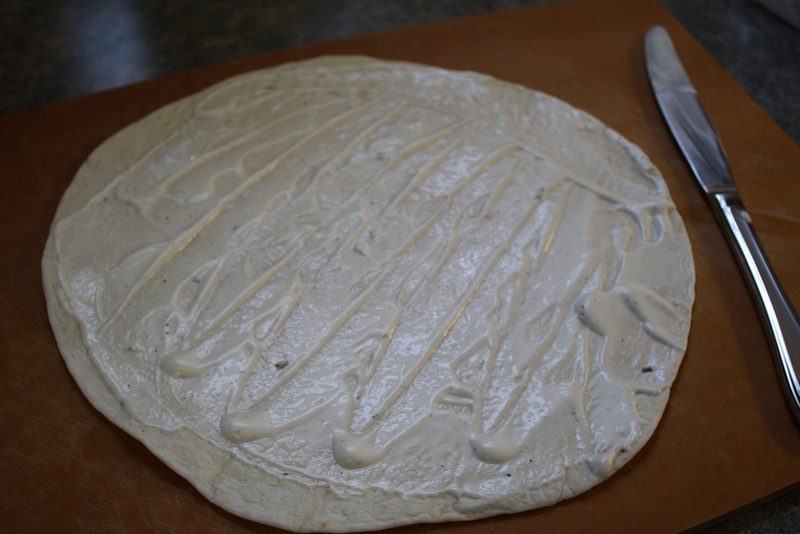 Next, spread the Ranch dressing evenly across the tortilla. We can use the dressing to help keep the tortilla in place once wrapped. 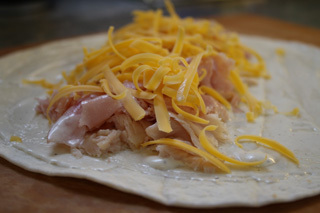 Then tear up the turkey and ham and spread it evenly across the center of the tortilla. Top it off with cheese, lettuce, and diced tomatoes. Now for the most frustrating part: wrapping the tortilla without tearing it or losing ingredients! 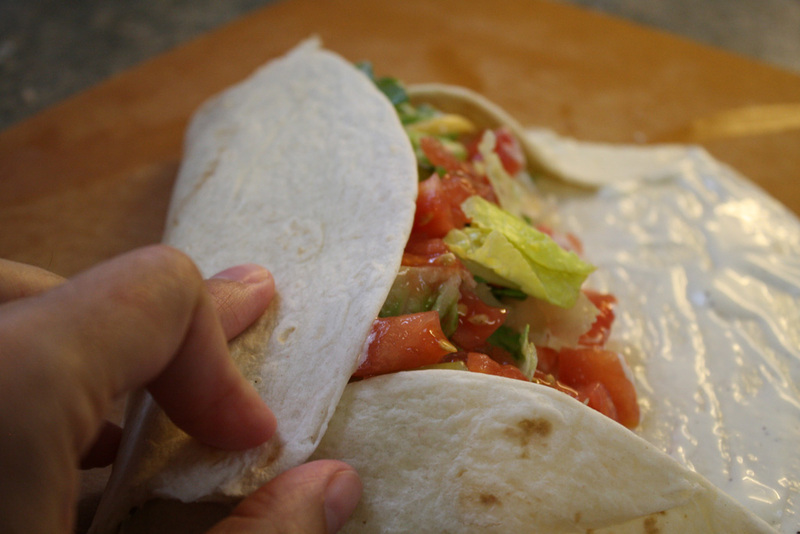 Start by folding one end of the tortilla in about 1/6 of the way, making sure it goes slightly over the ingredients in the center; repeat on the opposite side. This will be our "bottom" of the wrap so we don't lose our ingredients. Next, start from one side and fold the tortilla toward the center, careful of the inevitable escape attempts of the ingredients. Pull the other side toward the center and tuck it under as necessary. 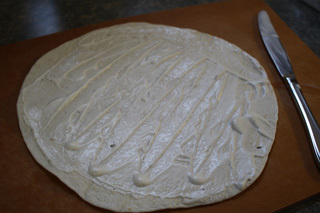 Use the Ranch dressing to help hold the tortilla in place and / or add 2 toothpicks to each half. Get your plate ready and cut the ham & turkey wrap into two parts. Serve with a side of chips, fruit, or veggies! This delicious meal will keep you full and satisfy your desire for a homemade meal. Enjoy!